Map of Colombia and Venezuela. 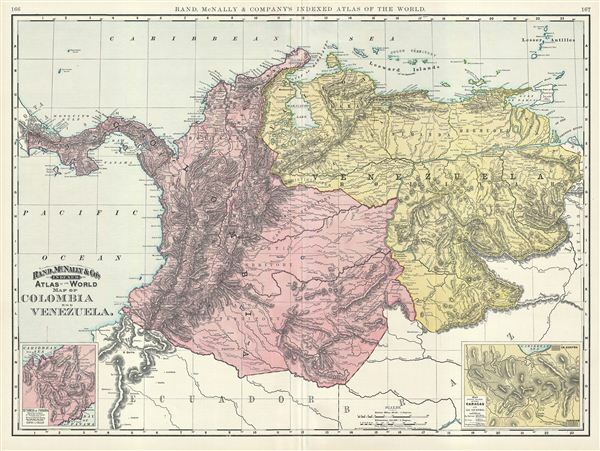 This is a beautiful example of Rand McNally and Company's 1892 map of Colombia and Venezuela. It covers from Panama (a province of Colombia at the time) to the Delta of the Orinoco River. An inset in the lower left quadrant details the Isthmus of Panama, while another inset in the lower right quadrant features shows the railroad between Caracas and La Guavra. Colombia, at the time, was witnessing the end of the Thousand Day's War, a civil war between the liberal and conservative parties within the country. The war ended with the signing of the Treaty of Neerlandia. The cease fire agreement and th subsequent signing of the Treaty of Wisconsin resulted in a conservative victory and the eventual independence of Panama. Color coded according to countries, the map notes several towns, cities, rivers, mountains, and various other topographical details with relief shown by hachure. This map was issued as plate nos. 166 and 167 in the 1895 issue of Rand McNally and Company's Indexed Atlas of the World - possibly the finest atlas Rand McNally ever issued. Rumsey 3565.045 (1897 edition). Philip (atlases) 1026 (1898 edition).